Motor nucleus lies in pons. 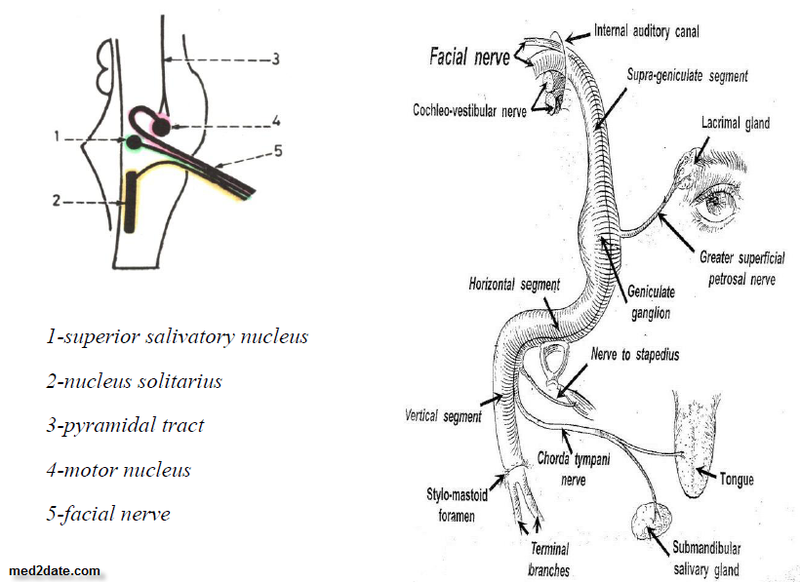 Superior salivatory nucleus: in pons, parasympathetic secretomotor to lacrimal, submandibular, and sublingual glands. Nucles solitarius: in medulla, sensory, carries taste sensation from the tongue. Motor fibers form the motor root, while parasympathetic and sensory fibers join to form the sensory root (nervus intermedius). The 2 roots emerge on the side of the brain stem, at junction between pons & medulla to cross CPA to I.A.M. Controlled by pyramidal & extrapyramidal fibers. Labyrinthine segment: runs in the I.A.C superior to VIII & anterior to superior vestibular nerve, runs laterally to medial wall at geniculate ganglion. Tympanic (horizontal) segment: starts at geniculate ganglion, curves to form 1st genu, runs backwards in medial wall till the posterior wall. Mastoid (vertical) segment: Runs inferiority (2nd genu), lies antero inferior to lat. SCC, then vertically downwards to leave skull at stylomastoid foramen. Enters parotid gland >> divides into terminal motor branches. a) Greater superficial petrosal: arises at geniculate ganglion >> secreto motor parasympathetic to lacrimal, nasal, palatine glands. b) Nerve to stapedius: motor supply to stapedius. c) Chorda tympani: exit just above stylomastoid foramen to enter ME >> carries taste from ant. 2/3 of tongue & secretomotor parasympathetic to sub lingual and sub mandibular glands. Two motor branches to stylohyoid & post belly of digastric. Posterior auricular nerve: motor to occipital belly of occipitofrontalis. Temporal, zygomatic, buccal, mandibular & cervical supply muscles of scalp, face, auricles & platysma.